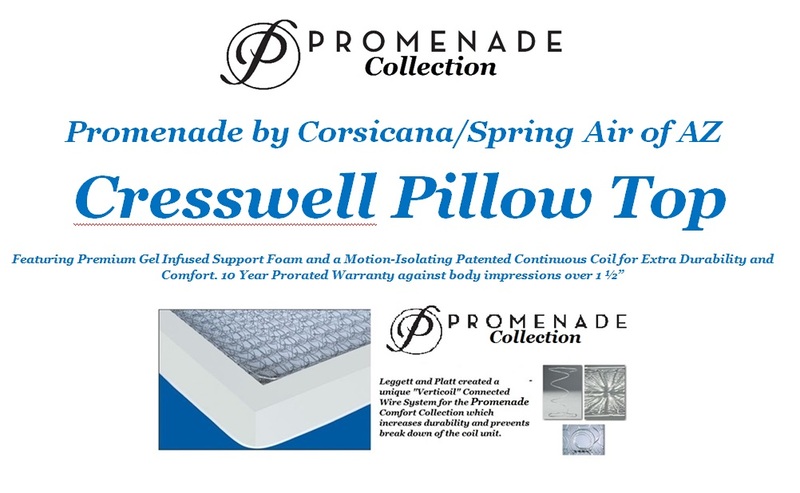 The Promenade Kennewick Double Sided "Firm" Mattress offers a throwback to an older generation where mattress companies produced double sided covers with customer's and longevity in mind. These mattresses when rotated and flipped correctly and frequently throughout their life can yield upwards of 15 years for standard weight sleepers. While Serta is another brand that offers double sided "Hotel" mattresses, the prices from the Promenade Collection are less than half for a similar feel. A Connected Coil "Verti-Coil" Middle by Leggett and Platt helps to prevent body impressions for many years. It is Manufactured by Corsicana under a partnership with Spring Air to help save costs for our customers. We recommend this set for young adults or guest room scenarios for those who prefer a medium top with a supportive core.